UNITED NATIONS, November 23 -- With Staffan de Mistura leaving his post as UN envoy to Afghanistan, there's been speculation about who would replace him. On November 22 Inner City Press asked Secretary General Ban Ki-moon's spokesman Martin Nesirky to confirm what Hamid Karzai's office said, that Ban had called and notified Karzai of the identify of de Mistura's successor. Nesirky replied, " I can confirm there was a phone call, but I can’t tell you anything about the nature of the phone call. If I have any more details, for example, on any announcement on staffing, then I’ll let you know." 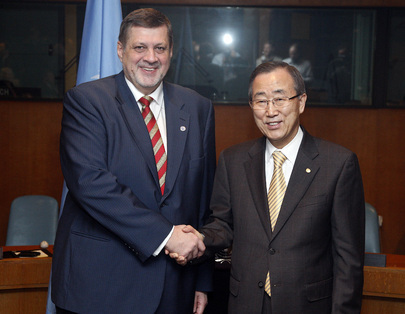 Kubis has previously served, among other posts, as Slovak foreign minister and as head of the UN Economic Commission for Europe. When de Mistura after bragging to Richard Holbrooke that he had the Afghan job then temporarily said he wouldn't take it, along with Jean-Marie Guehenno and Ian Martin (now in Libya), Jan Kubis was in mix, reported at the time by Inner City Press, for the Kabul job. And now he has it. It's a small world or at least, for the UN, a small bench. There are several accountability issues that come to mind. It is not clear if Kubis' involvement in Kyrgyzstan had any impact on the lack of accountability to date for violence, mostly against Uzbeks, in mid 2010. While de Mistura repeatedly told Inner City Press he was pushing for accountability for the murder, by Afghan national forces, of UN staffer Louis Maxwell, now de Mistura is leaving and nothing has been done. Will it, under Kubis? Watch this site.